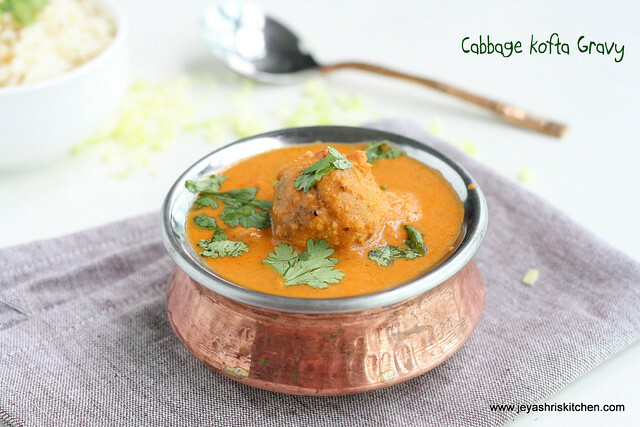 Cabbage kofta recipe, low fat koftas using cabbage, cooked in a tomato based gravy. I never know that we can make koftas with Cabbage and this is the first time i attempted and it turned out well and was a super hit among the kids. 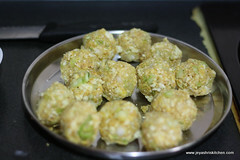 Actually i wanted to deep fry the kofta ballas as i did for Malai Kofta Recipe, but after i start putting one ball in oil, i felt it absorbed more oil. So i immediately changed the idea of deep frying it and made it in a paniyaram pan. Though it took little extra time , but still we can have guilt free koftas. 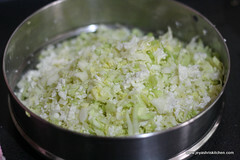 Add the chopped cabbage and scrambled paneer in a wide bowl and add salt. Keep this aside for 15 minutes after mixing well. Now squeeze out the extra water as much as you can and keep it aside. 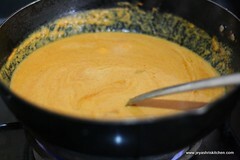 Add red chilli powder, garam masala, little salt,besan and mix well. Now start making balls. If you still can’t bind this properly add 1-2 tblsp of besan to this cabbage paneer mixture and start making balls. It yielded approximately 12 balls for me. 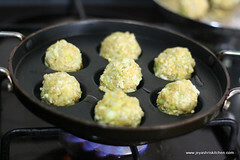 Heat a paniyaram pan, and add little oil to this and start cooking the kofta balls in a medium low flame. This will take little time but instead of deep frying this method is ok.
Cook all sides by turning it around till it becomes golden brown in color. Koftas are ready. Keep this aside. Roughly chop the onions and peel the skin of the garlic.Saute this in a tblsp of oil till the onions turn brown. 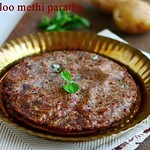 Grind this into a smooth paste along with tomatoes,chilli powder, kasoori methi and tomato ketchup. 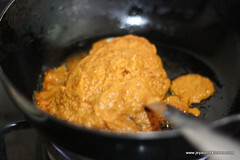 In a pan add oil and add the ground masala. When it leaves oil on the side add the milk ( i used full cream milk) and add 1 cup of water too. 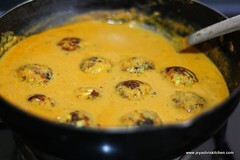 Make the gravy little thin as after adding the koftas the gravy will thicken . 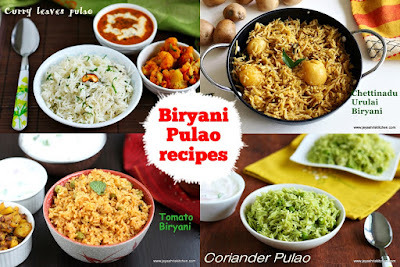 Add garam masala to this and mix well. When the koftas are completely cool, add to the hot gravy and switch off the flame. These koftas stayed in the gravy as it as for 4- 5 hours. 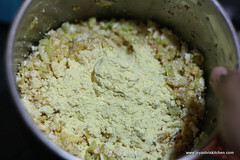 Always ensure that the water is completely squeezed out from the cabbage paneer mixture. I absolutely loved this and will surely be trying it myself :) thanks jey! 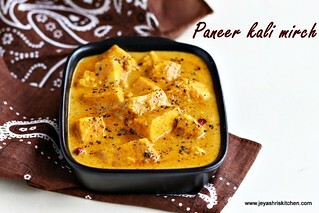 I love this curry...I deep fry sometimes otherwise I do the same in paniyaram pan for regular use..
Looks yummy Jeyashri. 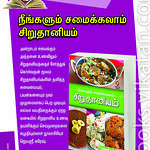 I also use the paniyaram pan for kofthas. Truly guilt free. got your comment about DMBLGIT album. Pls click on the picture icon at my sidebar, that should bring you direct to the google+ album. Let me know if this works, as it works on my computer. 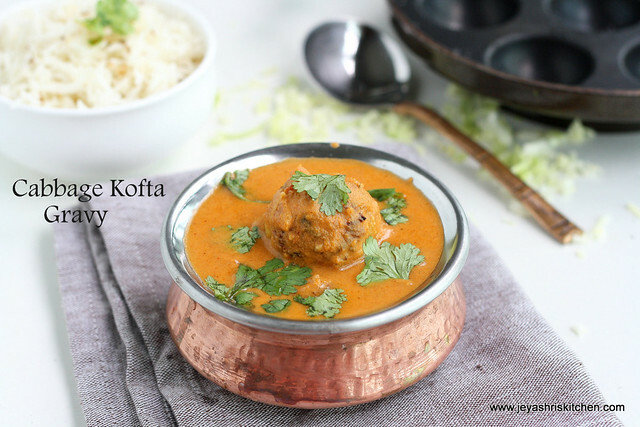 Delicious and tempting kofta with cabbage...Loved the creamy curry..yum..
Good idea of using paniyaram pan for frying koftas. Healthy! Loved it Jeyashri. it looks so good & guilt free.. makes the day more happier :).. i have switched to this mode too.. though time consuming , worth it totally! awesome! What I find interesting is that u havent fried these koftas... Yumm!!! 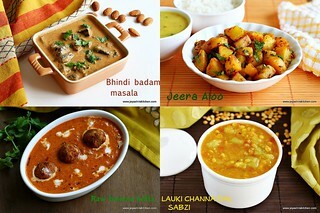 Gravy looks simply rich and irresistible, even i stopped frying koftas now,am using paniyaram pan too. 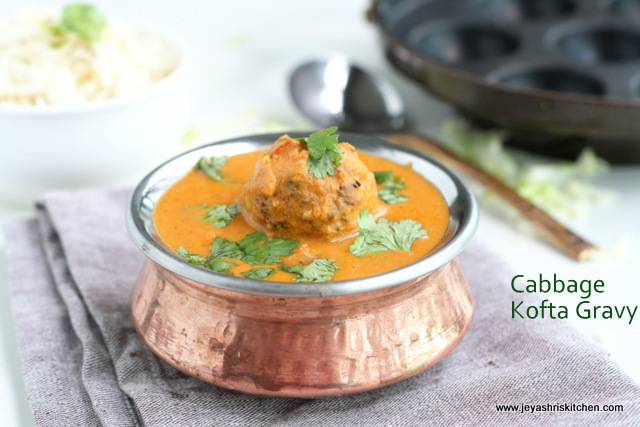 The gravy looks awesome, nice idea with the paniyaram pan..
this kofta recipe looks so delicious. I was wondering if there is an alternative to those special pans? do you think I would be able to bake it? Though i haven't tried baking koftas, but i have see my friends baked this. I do make in paniyaram pan cos of to much oil for regular diet... And yes it is equally tasty too. 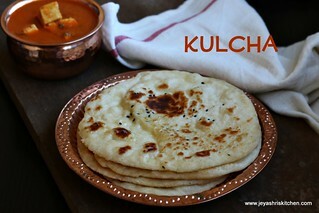 Way too tempting ....wish to have roti and this sidedish right now. Tried it today.. it was yummmm.It has never come out so well before. So Took a picture of my kofta. 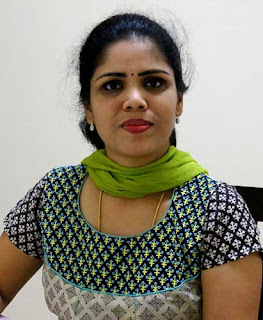 Thanks Jayshree. Oh great, send me the picture to my mail id, will share in my Facebook fan page. 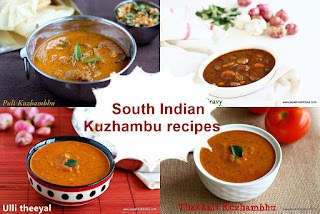 Sounds delicious, nice idea to use paniyaram pan for koftas. 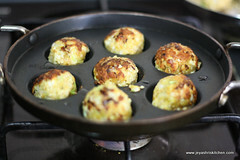 The cabbage koftas look very yummy...i also never deep fry them i always make them only in the paniyaram pans....its as if the paniyaram pans are made specially to cook the koftas. Dont you saute the tomatoes for the gravy? DO you add them raw for the puree?? I didn't saute the tomatoes, just added to the sauted onions while grinding. Just to avoid anonymous comments i have enabled this, nothing like not allowing word press. Blogger doesn't have that option. Very healthy koftas..really it's a guilt free side dish. 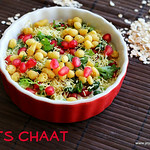 good vegetarian dish to try out and along with tandoori roti and little bit of tomato ketchup it tastes more better..